Right. 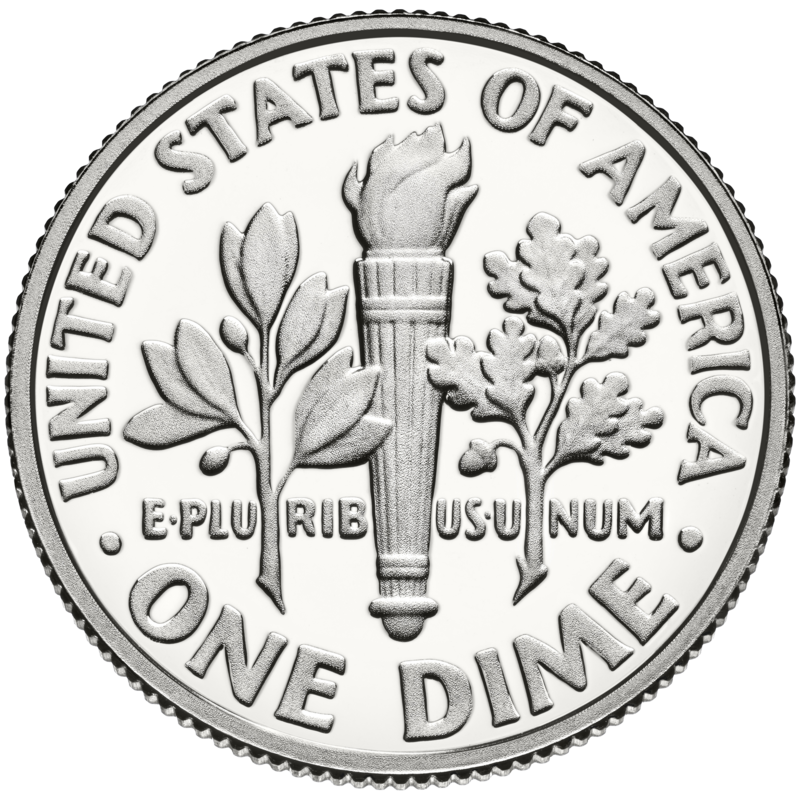 Ten whole cents. Point being, it was an odd topic of conversation. Regardless, it brought back a flood of memories. Remember this product? It was 1991. I was young and still finding my footing around the kitchen. The idea of opening a jar and creating a gourmet meal didn’t seem quite so farfetched back then. I wasn’t sure what “country French chicken” was, but by god it sounded high-falutin’, and I wanted to impress the girlfriend. So I picked me up a jar of Chicken Tonight and set to work putting together a meal to remember. It was memorable, alright. ‘Cause it was godawful. And no amount of tarragon could disguise that fact. Actually, because of that single jar of Chicken Tonight, I despise tarragon to this day. It’s no wonder they stopped selling this stuff in the U.S. But it’s still available in Europe, so if you ever travel across the pond…you have been warned. 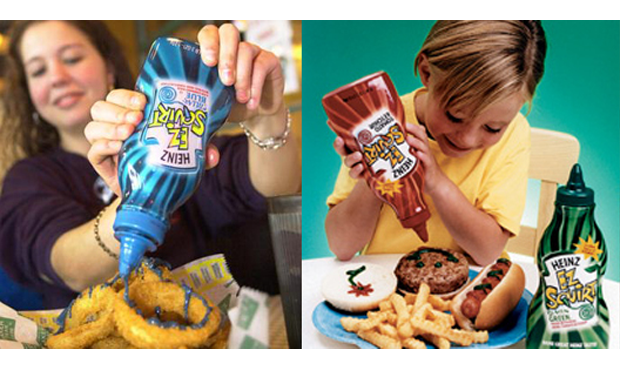 This product reminded me of other food flops over the years. Some I actually tried. Like this. The lesson to be learned here: if it ain’t broke, don’t fix it. We don’t want ketchup in bright colors – but we need a little color in our cola. 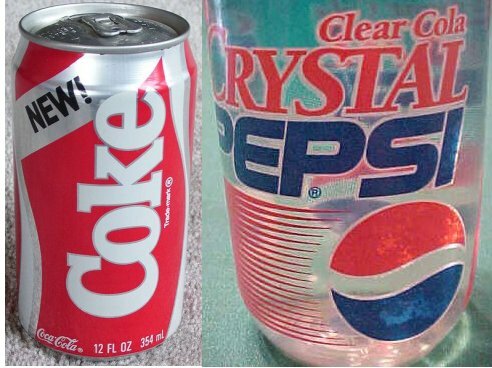 Speaking of cola, if yours has been a worldwide hit for nearly 100 years, why change the formula?! Fortunately, other products were before my time or never made it into my grocery cart. Bacon in the toaster? Hello, grease fire. Gerber’s “gourmet” baby food for adults? I would never feel like creamed beef tonight. And celery flavored Jell-O? Hell-NO. In contrast, some really good products over the years have since been discontinued. Like Wasabi Funyuns, which came out in 2005. Man, was I hooked! That salty, slightly spicy burn was like crack, I tell you. Not that I know what crack is like. But they were awesome. I remember working with a vendor who was trying to earn our business, and she thought she could win me over by showing up with a couple bags of Wasabi Funyuns. Shame on her for thinking I could be bribed so easily. But, remember how I said they were awesome? Yeah. Bribery was easy, it turned out. ‘Cause she got our business, based solely on my Wasabi Funyun-inspired recommendation. Sadly, they were gone within a year. But their memory lives on forever. Are there any food products you despised? Or any you wish they’d bring back? I felt a little barf in my mouth just thinking of all of it. Ewww! I came across chocolate instant noodles and that terrifies me! Pike Place Market in Seattle has a vendor who sells chocolate noodles. They hand out uncooked samples of fettuccine. I have to admit, they weren’t as bad as I’d feared. I begged for the peanut butter and jelly combo in a jar when it first came on the market, but alas we never got it. “But all my friends have it” never worked at our house. Celery flavored Jell-O? That’s just gross. “But all my friends have it” never worked for me either, especially when Cookie Crisp cereal was popular. I led a very deprived childhood, as you might gather. Yes, Mark, I TOTALLY remember that commercial! I had no idea though that it was back in 1991!?!? As Honie Briggs shared in her comment, one of the things I never tried because I thought it looked so gross, was Smucker’s Goober Peanut Butter and Grape Jelly. Whenever I make a peanut butter and jelly sandwich, I want to add them separately, not all together. Plus, I don’t like grape jelly, I prefer jam or preserves. “Reddi-Bacon” Now that’s a product I had never heard about. I don’t “get” the appeal of Goober’s, either. How lazy do you have to be to want your peanut butter and jelly together in the same jar?! Unfortunately, I remember the commercial! The food I most miss is Stouffers Ham and Swiss crepes in a white wine sauce. Gourmet frozen food! My kids miss Kelloggs Pastry Swirls and Smuckers Magic Shakes. Nothing like an instant chocolate milkshake, no ice cream needed! Of all the frozen food companies, I think Stouffers is probably the best. I didn’t totally despise their lasagna growing up, and actually think the mac ‘n cheese is pretty good. 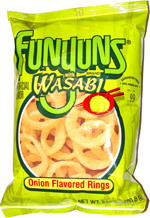 I feel like wasabi flavored funyons shouldn’t be difficult to bring back. I mean if jalapeno cheetos can make it? (They’re delicious too btw.) And with Lays potato chips doing all these test flavors, you should submit wasabi flavoring as an option. I came across a couple of online petitions to bring back Wasabi Funyuns, and there is a Facebook page dedicated to the cause, as well. I’m crossing my fingers that it will make a comeback! I agree, jalapeno Cheetos are pretty good, too. I was not so crazy about the garlic bread or chicken and waffle Lays, though. Howsabout mashed potatoes made with real potatoes. What else do you make them out of ? String beans? I also hear fat free lettuce is now the rage.